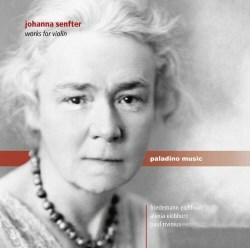 Johanna Senfter is almost forgotten today, unjustly in my view, so this new release from Paladino is most welcome. Browsing the catalogue you'd be hard pressed to find much of her music. The only other CD I could find devoted exclusively to her work is a recording of her piano music on the Wergo label, and that dates from over twenty years ago. This was a composer with a substantial oeuvre to her name, including 8 symphonies, 3 violin concertos, single concertos for piano and viola, string quartets, piano trios, choral music and lieder and a healthy crop of piano music. What steered me to this recording is that I recently came across a performance of her Fourth Symphony on YouTube, and have since become a convert. Senfter’s neglect can partly be put down to the fact that she turned her back on modern trends such as twelve-tone technique and serial composition. Who was she? She was born in Oppenheim in 1879, and died there in 1961. She studied at the Hoch Conservatory in Frankfurt - composition with Iwan Knorr, violin with Adolf Rebner and piano with Karl Friedberg. After completing her diploma, she became a private pupil of Max Reger in Leipzig. Reger greatly admired her as a composer and did much to champion her music. As a violinist, the instrument retained a prominence throughout her life. Two of her sonatas for violin and piano and two suites for two violins feature on this release. The dating of the Sonata in G minor, Op.32 cannot be determined with any certainty, but was probably composed between 1917-18. It had to wait until 1924 for its premiere in Oppenheim. In four movements, the work's opener, heavily indebted to Brahms, especially in its piano writing, is expressive and expansive, with moments of ecstatic rapture. Throughout, there's an underlying melancholic vein. The two inner movements are lighter in mood. No. 2 evinces some accomplished contrapuntal writing, whilst No. 3 is a sprightly, capricious scherzo-like gambol. The finale takes a simple folk-like melody through several variations. Once again we cannot date precisely the Sonata in A major, Op. 26, but it's very likely to have been penned sometime between 1914-18. Passionate and lyrically mellifluous sums up the first movement. It's followed by a Lustig, nicht schnell which is heartfelt and sincere. The third movement is a good-humoured romp, whilst the finale is perky and effervescent. The violinist Friedemann Eichhorn and the pianist Paul Rivinius instil plenty of excitement into the faster movements of the Sonatas, whilst conveying magical allure into those which are slower. Rhythmic precision, matching phrasing and dynamics all add to the success of their performances. They convey a real love for and commitment to the music. The Ten Early Dances date from the late 1930s to the early 1940s, which the composer divided into two suites (Op. 91 1/2). Senfter follows the lead of her teacher Max Reger, who enjoyed composing in the ancient style. So the Suites follow the tradition of the French violin duos of Boismortier, Corrette and Leclair. The First Suite has a more traditional sequencing: Allemande, Courante, Sarabande and Gigue, whilst the Second Suite takes a different course: Allemande, Bourrée, Menuet, Loure and Passepied en Rondeau. We must remember that the composer was a more than competent violinist in her own right, and this accounts for the inventive and resourceful violinistic writing revealed in these works. They are steeped in the spirit of Reger, and certainly provide a more challenging listen than the sonatas. Friedemann Eichhorn is joined by his wife Alexia Eichhorn, and both players negotiate the formidable technical demands with consummate skill and authority. Their bold rhythmic audacity is something to be admired. I have to say that I'm won over by these recordings. Senfter's music displays a wealth of imagination and fantasy in addition to adroit craftsmanship. Here’s hoping this recording will kick-start a renewed interest in this long forgotten composer.